I can just taste it...it's almost here...and for some of you a lot faster than it is for me. 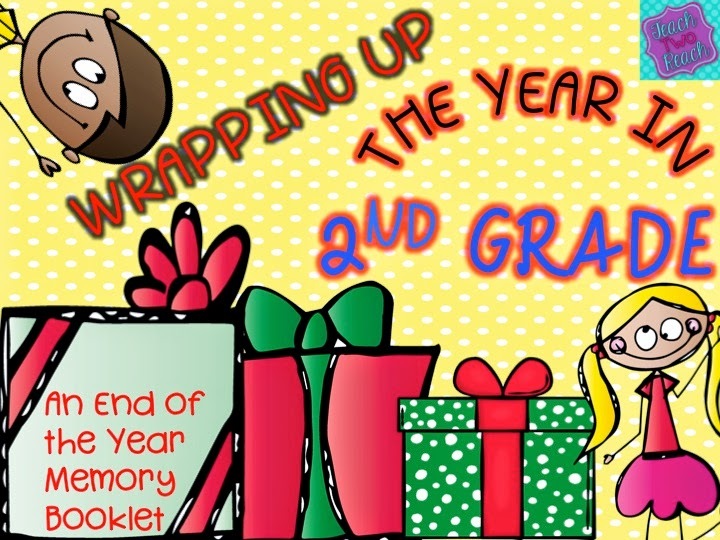 The end of the year is still some time away weeks wise, (students go till June 26th and teachers into the first week of July), but still...time is FLYING and I know it will be over before I know it. I have loved teaming up with other 2nd grade teachers to share our ideas. I can't wait to read everyone else's too! Big thanks to Angela from Hippo Hooray in 2nd Grade for setting this all up. The end of the year is a trying time as well. Kids love to go bananas and we go bananas over the kids going cray cray! I think it's survival of the fittest at this time of year. I'm here to share with you some end of the year ideas that I've done versions of in the past, and plan on implementing this year as well. If you do a money management system, or even if you don't and give students some sort of currency (tickets..etc. ), this will be just a bucket of fun! I like to try to put much of my left over treasure box items up for auction. Basically, students have saved money that they haven't used for other things...some have more, some have less. I lay out all the items that are going to be bid on. We go over the rules of a silent auction and students can either raise their hands or hold up an object such as a Popsicle stick when they want to bid on something. I'll describe all the items before I begin so students can be aware of what there is and if they would like to wait out for something. Then I start with random items and depending on the quality of the item, I start the bid. For small items, it will be something like 25 cents and then go up, and prices vary for others. I usually have multiples of smaller items so I say like, "5 kids can this item." Then it is bidding time. I keep on increasing the price until the last kid (or kids if there is more than one of the item), standing gets it. Then we move on to other items. Some kids love to get a bunch of little things. Some kids hold on to their money for the bigger items. But I always tell them they are taking a risk holding out as well because they might not get it. Sometimes what they want gets bid on by a higher bidder, and so it doesn't go to them, so then they just bid on other things. Basically, I make sure that everyone gets something. I learned this when I was student teaching 8 years ago. I have not done it every year, but plan to this year. 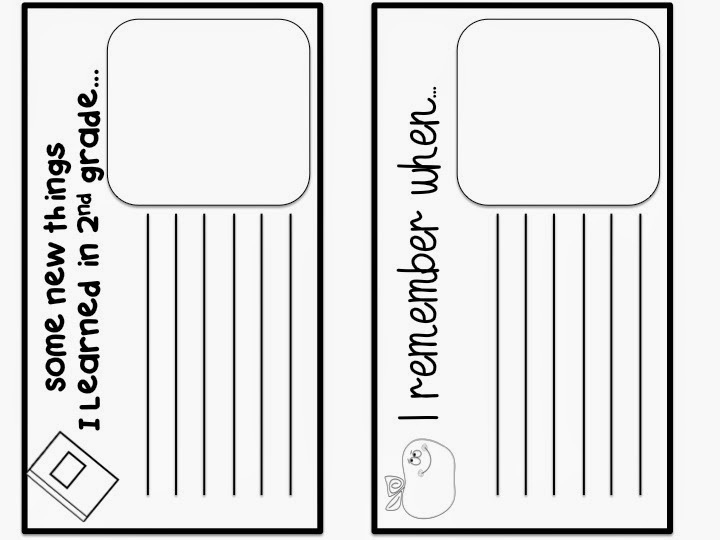 I put a picture of each student in the middle of a piece of paper that has spaces to write going all around the picture. The number of spaces depends on how many students there are. Then, we arrange our desks so that it is easy to pass the paper to the student next to them and that the rotation can be nice and circular without students getting confused as to who gets the paper next. 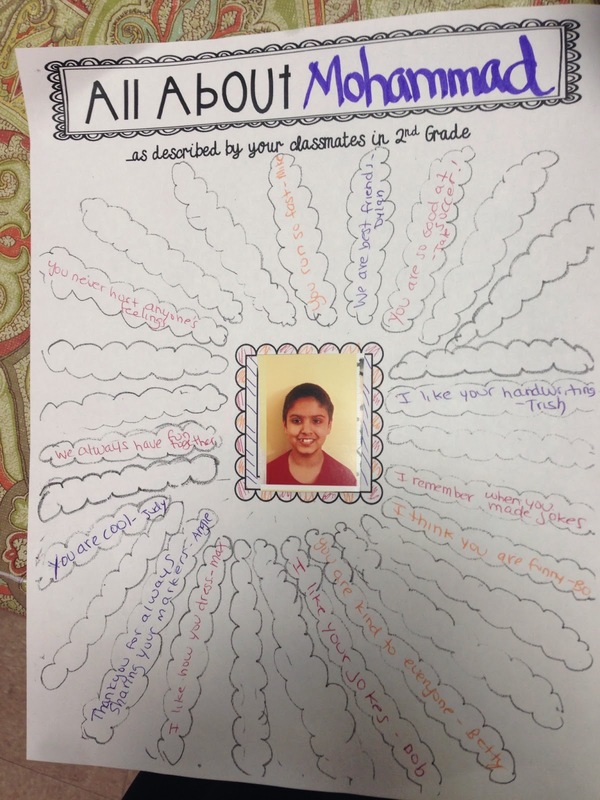 I give each student a person to start with (not themselves), and they write one kind or nice thing about the person in the picture. They write their name after their sentence. Different color pens look good. Then we all rotate the papers at the same time. By the end, students will have written a compliment for each other student in the class and I will make sure I leave a space for my compliment as well. This serves as a beautiful keepsake that students can treasure forever. I am attaching a link to the PDF file that has the template - it will have the place in the middle for the picture and the title. 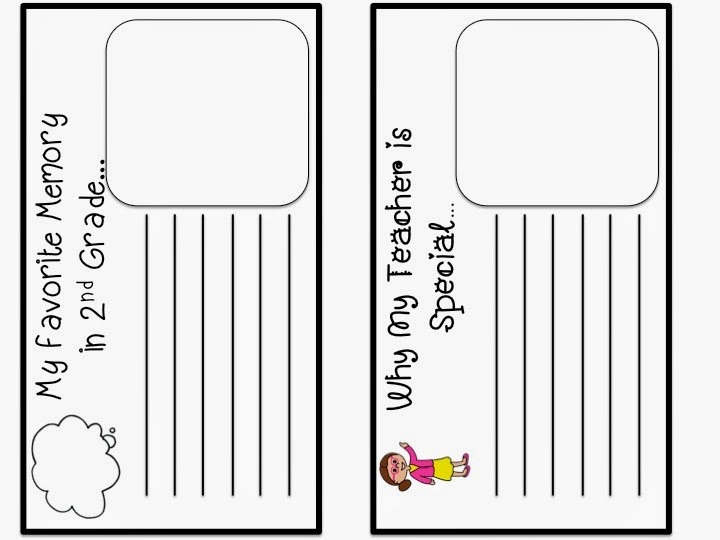 You will need to add in the bubbles to write in according to the number of students in your class. Enjoy! 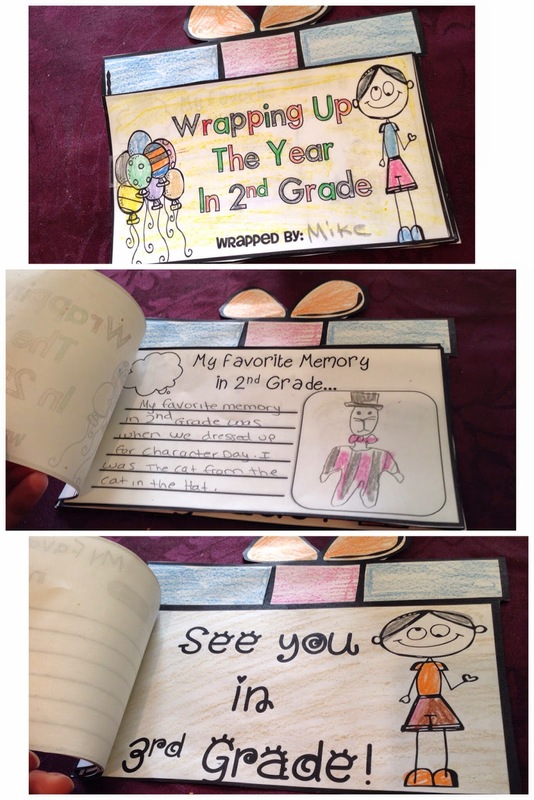 This memory book looks like a gift...hence the name. I've included a bunch of prompts for the students to draw a picture for and write about regarding something in 2nd grade. You can pick and choose which ones you want to give to the students. Then put them all together, put the cover on the top, and staple it to the gift box template. I also have a 1st grade and 3rd grade version available in the store. Click here or on the picture above to take you to the product! 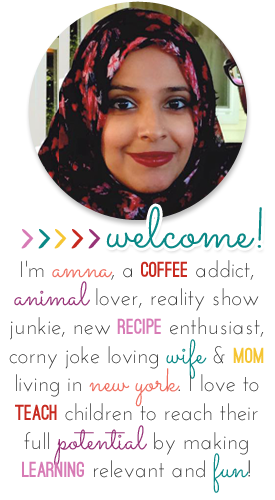 It is on sale during this Blog Hop! I hope some of these ideas can help you as you finish up this racing year! 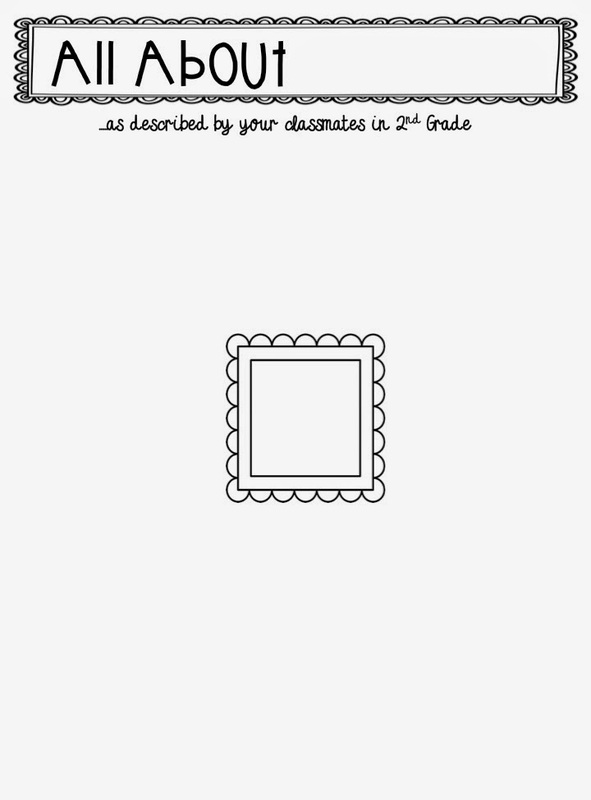 Seriously...I so clearly remember getting prepared for the beginning, stalking teacher Instagram posts for ideas, pinning things that I would probably never look at again because I am the worst pinner organizer on the face of the planet, and just starting up a blog. 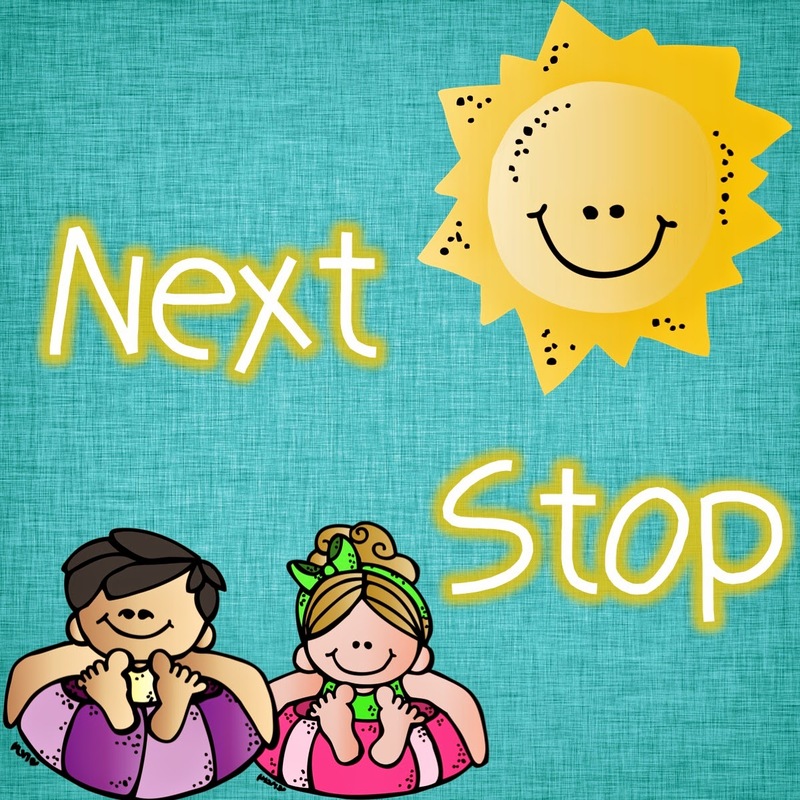 And now, it is coming to the end and I hope that it goes smoothly for all of you! 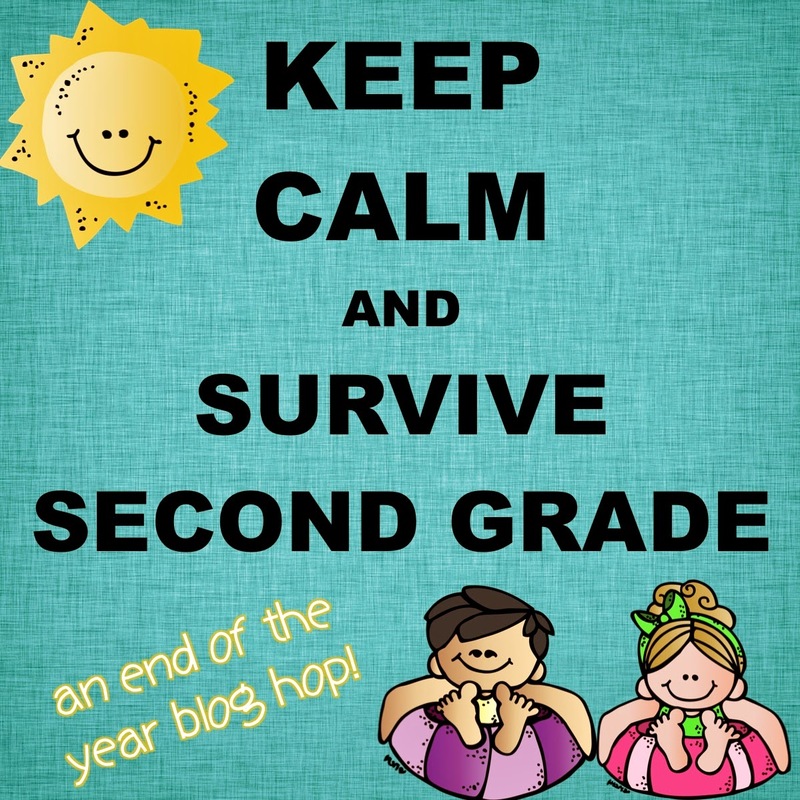 Please hop on over to Chrissy from Adventures in 2nd Grade to see some more awesome ideas! This booklet looks SO cute! I will have to go check it out when I'm done hopping!